No one likes going to the doctor when they’re sick, which is why we emphasize total wellness through preventive health care at Maryland Medical First in Parkville, Maryland. As our patient, you will become more aware of your risk factors for developing serious health problems, and you will be better able to take care of yourself and maintain good health. When you’re sick or injured, we will take care of you wherever you need to be treated – in the office, hospital, rehab, or nursing center. As internal medicine doctors, we are well-equipped to provide preventive medicine, including immunizations and vaccines, physicals, and health screenings. We also treat acute illnesses and manage chronic disease for patients with diabetes, arthritis, heart conditions, weight problems, and many more conditions. If needed, we will refer you to a specialist who is equally as compassionate and dedicated to patient care as we are. All of our doctors and providers also care for dementia patients and coordinate end-of-life discussions to facilitate a smooth transition into hospice care. In addition to primary care for acute and chronic conditions, Dr. Narender Bharaj specializes in wound care while Dr. Bhavneet Bharaj is an expert in weight management and medical fitness. We invite you to become a part of our Parkville, Maryland primary care practice and one of our many satisfied patients. You’ll be greeted by our friendly and proficient staff members with warm smiles who are eager to help. No question is unimportant when it comes to your health. Call (410) 661-4670 to schedule an appointment or use our secure online appointment request form. Hear how the doctors at Maryland Medical First have helped our many satisfied patients. 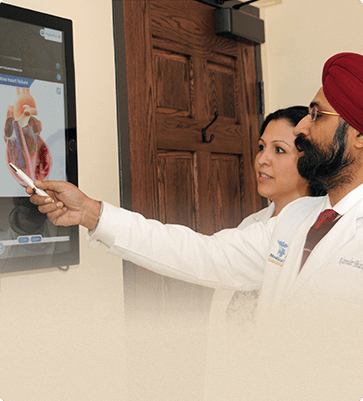 Explore the many conditions we treat and treatments we provide in our award-winning patient education center. Copyright © Maryland Medical First, PA. All rights reserved. The providers at Maryland Medical First offer comprehensive primary care to patients in Parkville, Maryland, and surrounding areas. In addition, Dr. Narender Bharaj provides wound care for chronic, nonhealing, diabetic, and vascular wounds and abscesses.